In these days when times are harder, it makes sense to keep chickens - so long as they are suitably housed & cared for, of course. It means you can enjoy your own eggs for breakfast, omelettes too - and if you grow herbs and salads too, you can flavour your dish & colour your plate with greenery. Benefit from your own eggs for breakfast, omelettes and if you in the garden, you can flavour your meals with those. For more information about keeping hens, visit the Hen Keepers Association. It’s an information network for those who keep hens for pleasure. It has information on the health, welfare and management of hens. 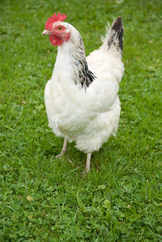 It also campaigns on their behalf on issues such as protection small garden flocks against avian flu. The site has lots of tips and hints to help you keep your birds safe and well. You can also join the Hen Keepers Association's campaign to protect family flocks of hens. All it takes is a phone call, an email or a letter in the post. All the details are on the site. Emma Bridgwater has a lovely Year in the Country Chickens 1/2 Pint Mug Box which would make a great gift for hen lovers. Click here to go to Emma Bridgwater's website.